Burton Abbey was founded in 1002 by Wulfric Spot, the extremely wealthy Earl of Mercia, and was granted a charter by King Ethelred in 1004. As a Burtonian ‘born and bred’, I was dumbfounded at the sheer scale of Burton Abbey which occupied a 14 acre site. I remain amazed that I could have lived in the Town for 50 years before discovering that such a structure ever existed. What I had always known as the Abbey was in fact, an almost insignificant annex which spent at least some of its time as an infirmary. 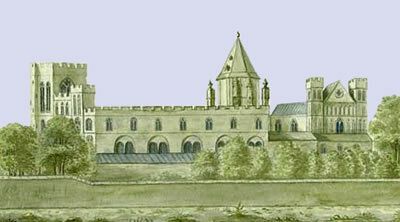 The picture shows what seems to be the most accurate image of the Abbey in its heyday; it is my own colourization of a 1661 engraving by W. Hollar. The first mention of a school was not until 1390. The reference to a ‘warden of the boys’ (custos puerorum) in Burton in this year suggests that there may have been an Almonry school within the abbey. Almonry foundations were common around this time in greater Monasteries in the 14th century, with the boys assisting in the celebration of private masses. The first ‘free’ (as in free of the church as opposed to without fee) Grammar School was founded by Abbot William Beyne in around 1520. The formation of the school however, was likely influenced by the Reformation in an attempt to gain political and financial stability in a time when King Henry VIII was launching campaigns against Monasteries and Abbeys with royal confiscations of the properties of religious houses. By removing the school from the everyday activities and finances of the Abbey and by creating a protectorate of local lay Trustees, the Abbey was to some extent protected. Thus, William Beyne, 32nd Abbot of Burton (1502-1531), provided funds to Sir Richard Sacheverell for land purchases a Orton-on-the-Hill (Leicestershire) and Breaston (Derbyshire), the rent from which would be used to found and maintain a school and master. The school was recorded to have occupied a site on the north-west corner of the churchyard. In 1534, Henry VIII had Parliament authorize Thomas Cromwell to ‘visit’ all monastries, including Burton Abbey, ostensibly to make sure they were instructed by the King instead of the Pope, but making sure to inventory their assets for later seizure. 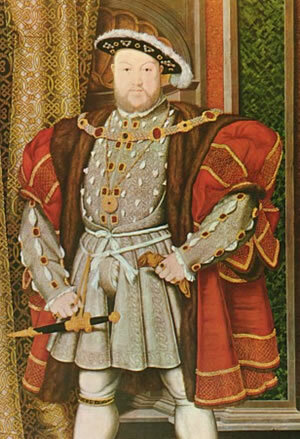 By 1536, Henry was installed as Head of the Church of England and had laws had been enacted to allow the King to seize any church building with an income of less than £200. Many were confiscated. Some were pillaged and destroyed, other smaller ones were turned into graineries, barns and stables. Whilst still under threat, the first recorded mention of a schoolmaster was in 1537 when Abbot William Edys, the 35th and final Abbot of Burton, appointed Richard Harman, a distinguished scholar and dignitary. As the Dissolution continued, many great Abbeys such as Glastonbury, Shaftesbury and Canterbury which had flourished as pilgrimage sites were reduced to ruins. Some were gifted to the Kings most ‘loyal subjects’. 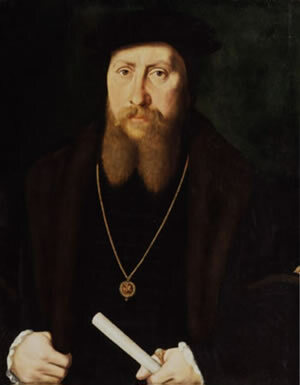 On 4th November 1540, Abbot Edys was finally forced to surrender Burton Abbey whereupon it was gifted (together with extensive grants to lands including what is now Cannock Chase) to Sir William Paget – a close adviser to Henry VIII who later became 1st Baron Paget of Beaudesert ( pictured ). This, fortunately, meant that the Abbey was one of the few to survive leaving it one of the largest in the country. A descendent of William Paget became the Marquess of Anglesey in 1815 and still owned most of the land in Burton. In 1545, explicit funding for a school and schoolmaster was included in the creation of the new Collegiate Church, which succeeded the Abbey following the Dissolution. Richard Harman remained as schoolmaster.